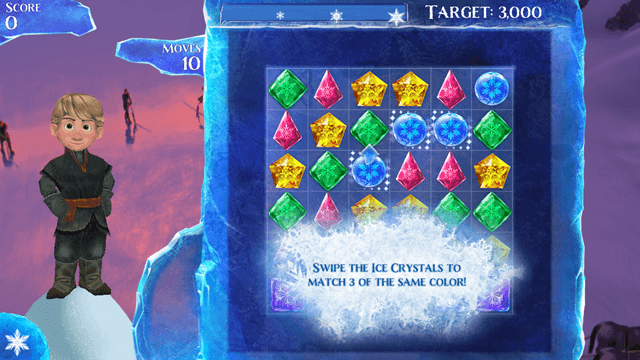 Frozen Free Fall is a free block matching and block breaker game for Windows 8 and Windows 8.1 devices. If you have watched Disney’s movie Frozen, you will be familiar with most of the characters in this game. 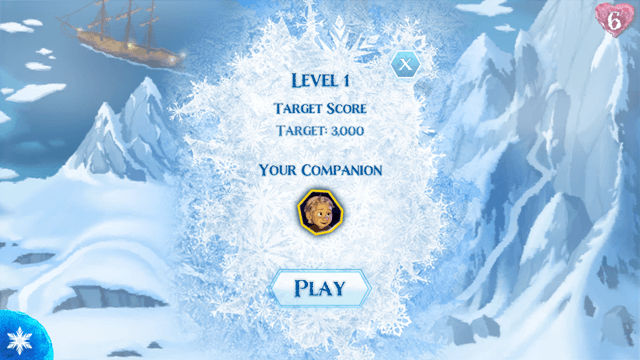 When you launch the game on your device, you will be presented with a screen where you can select the level that you wish to play. The game is based on the principle of matching three similar blocks together by clicking and sliding them to create groups of three. These groups then explode and this allows you to clear the level. You can also make combos by matching 4 or 5 pieces of similar blocks together and thus you will get a higher score. 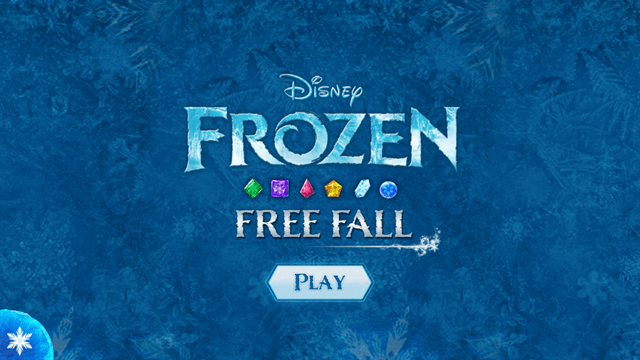 Frozen Free Fall is available for free from the Windows App Store. 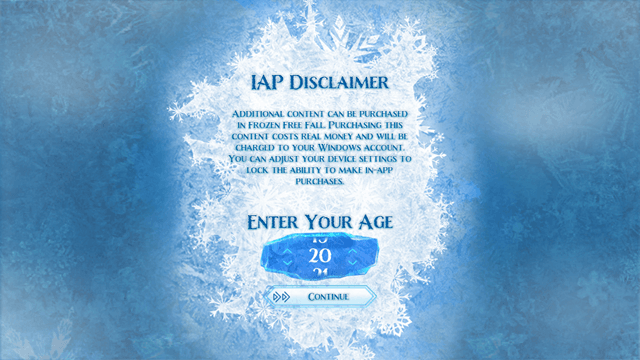 You will be presented with the following screen when you launch Frozen Free Fall on your Windows 8 device. After you have entered your age, you will be taken to the next screen of the game, where you can choose to actually start the game. Clicking on Play will take you to the level selection screen, where you can choose to play or replay any level that is available on the screen. Once you have clicked on a level, the game will start. Click Play in the above screen to start your game. Companions in the game vary according to the level that you choose to play. In the above level, you will be able to see the cute kid Kristoff from the movie Frozen, who not just stands around at the side of the screen, but also jumps with joy at each successful pair up of similar blocks. The target score is displayed at the top of the screen, and if the particular level has limited number of moves, they will be displayed towards the left side of the screen. The score that you are on is displayed in the top left corner of the screen. To pair up similar blocks, simply slide up the block that you wish to pair up with the other blocks. The way to clear the levels in this game reminds me of the game Candy Crush Saga! 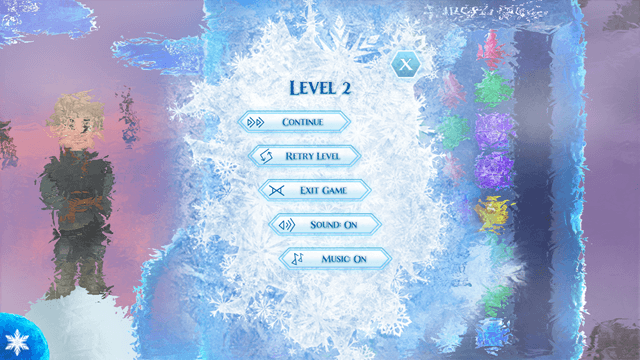 You can access the game’s menu at any time by clicking on the snow crystal at the bottom right corner of the screen. The game’s menu lets you access options to Continue, Retry Level, Exit Game, Turn the sound on/off and Turn the music on/off. Upon completion of a level, you are also presented with a screen that gives you a star rating based on your performance on that level (see the screenshot below). You can proceed to the next level by clicking on the option that corresponds to the same in the above screen. Overall, I love the game for its cute graphics and lovely render of actual movie characters from the movie Frozen (though I can’t help but feel that it’s a blatant Candy Crush Saga rip off for Windows 8). Nice concept, bonus frozen fractals for matching more than 3 similar pieces together. Star rating after each level based on the performance on that level. The concept is not new, it has already been used in games like Candy Crush Saga. Might lag and drain some battery on computers with lower end processor and graphics. 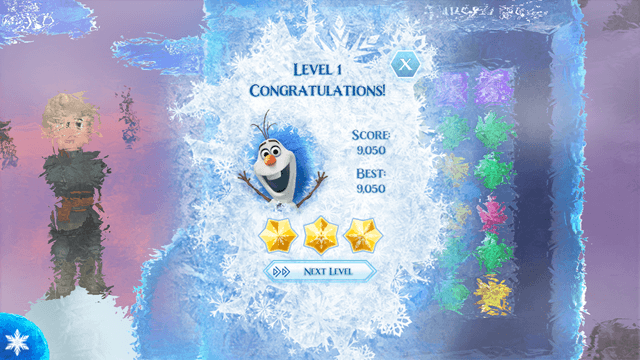 Frozen Free Fall is a great game to have on your Windows 8 or Windows 8.1 device. The game ran smoothly on my Windows 8.1 test machine, and I did not face any major problems like overheating with it. My only complaint with the game is that it tends to use a lot of processing power, and hence drains the battery. Overall, the game score points for its cute graphics, but at the same time, loses points for lack of new concept, large size and battery drain.